This post has been sponsored by Nespresso. All thoughts and opinions are my own. most days here in LA still require a sweater and lots of hot coffee. And just the other day, my brother sent me a picture of a snowstorm they were having in the Midwest, while my Grandma has been continuing to get snow flurries on the East Coast. Suffice it to say, no matter where you live, winter isn’t quite over yet. And, while I love spring, I’m taking full advantage of still getting to spend time by the fire, under a soft blanket, with a good book and a cozy coffee drink, for as long as I can. 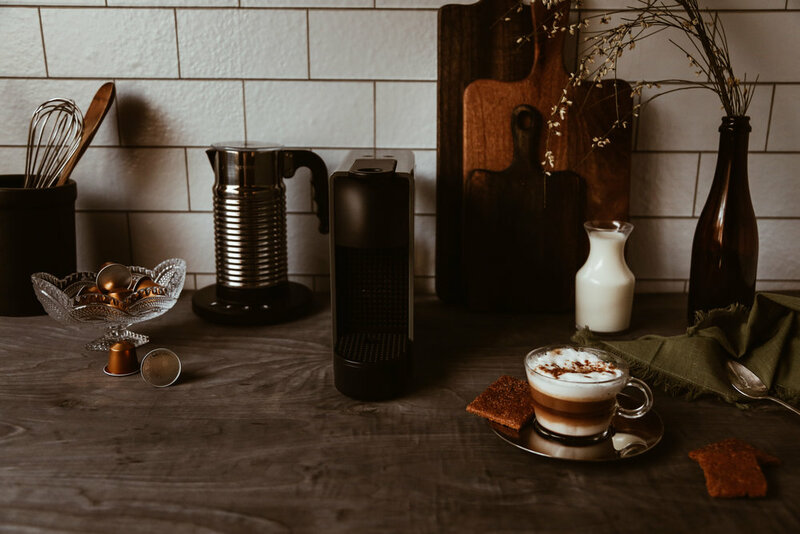 Speaking of cozy coffee drinks, you know how much we love to experiment with our Nespresso Essenza Mini Machine and come up with fun, new espresso drinks (check out some previous Nespresso recipes I’ve shared here, here and here). In fact, recently, after being inspired by a craving for s’mores but having no campfire to make them with (minor but important detail), the Mr. and I decided to try our hand at creating campfire mocha lattes instead. All I have to say is “Holy yum!” I may never be able to have a regular old mocha (or a s’more, for that matter) ever again! These are just that. darn. good. And, despite how fancy pants they sound, they’re actually super simple to make (with the right Nespresso tools, of course). And don’t worry, no camping, campfire or roasting of marshmallows is even required. You simply need marshmallow syrup (easy to find in any grocery store…just check the coffee + tea aisle), chocolate syrup (any will do, although you can find coffeehouse style ones in the coffee aisle at your local grocery store, which is the kind I like to use), milk (I use regular 2%, but you can easily substitute for the milk of your choice), a Nespresso capsule (we like making this with the Volluto capsules as they’re a bit lighter and the flavors of the espresso blend smoothly with the other flavors of this recipe, but feel free to use any capsules you prefer), the Nespresso View Lungo Cups and graham cracker crumbs to garnish. You could even skip the crumbs and serve a graham cracker on the side (either way, you can’t go wrong). While you can go the extra mile and add mini marshmallows on top, as well, the Aeroccino 4 machine does such a nice job of foaming the milk into a fluffy, creamy, delicious mixture, the marshmallows really aren’t even needed. 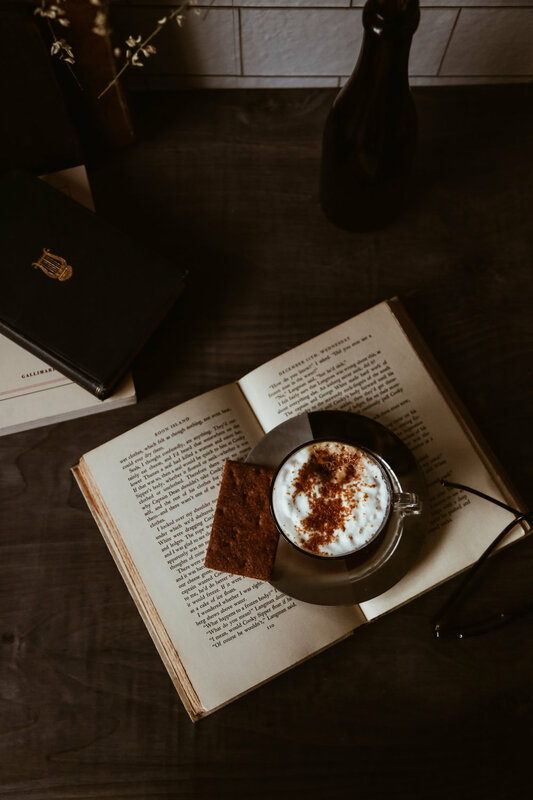 Outside of this s’mores latte, not much else—save for a good book—is really needed for a cozy morning or afternoon at home! 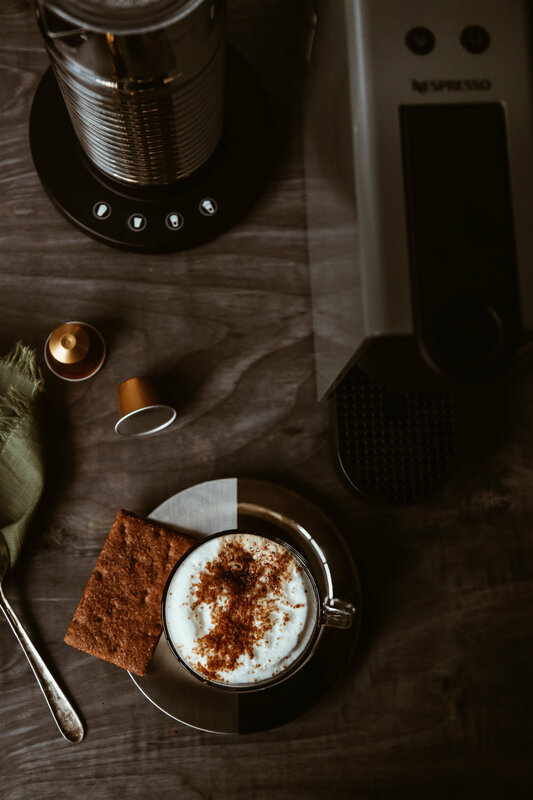 If you’re looking for more delicious coffee recipes, cozy or otherwise, be sure to hop over to Nespresso Pinterest. Then, once you have a recipe selected, click on over to nespresso.com so you can get just the coffee and tools you need to make it. 1. Add the marshmallow syrup and chocolate syrup to a cup (I like to use the VIEW Cappuccino Cups & Saucers.). Set aside. 2. Add the milk to the Aeroccino and froth. Pour the frothed milk into the mug and stir slightly to combine with the syrups. 3. Brew the Volluto capsule into your cup. Garnish with a sprinkle of graham cracker crumbs (optional) or serve a graham cracker on the side. Enjoy!